A dozen American Majority Action employees and volunteers descended on southeast Wisconsin the week before Election Day, knocking on more than 20,000 doors in an effort to get out the vote for Governor Scott Walker whose Nov. 4 win validated a truth liberals fight tooth-and-nail to suppress: that conservatives in the Badger State are not alone. “It’s interesting when you think about the last couple months ”” if not the last couple years ”” it’s interesting the challenges we faced. You see, there was a group out of Washington ”” Washington-based special interests ”” who thought they could spend a lot of money and a lot of time in this state and somehow convince the people in this state to be against something,” Walker said during his victory speech. Volunteers with American Majority Action, a conservative nonprofit organization dedicated to mobilizing political activists seeking to promote individual freedom and limited government, faced the Republican’s detractors, including apparently polarized residents of downtown Milwaukee and a POLITICO article more frigid than Wisconsin’s six-month winters that alleges the governor was eking by against then-opponent Mary Burke ”” a propagandized political environment enough to discourage Walker’s most ardent supporters but not the governor himself. 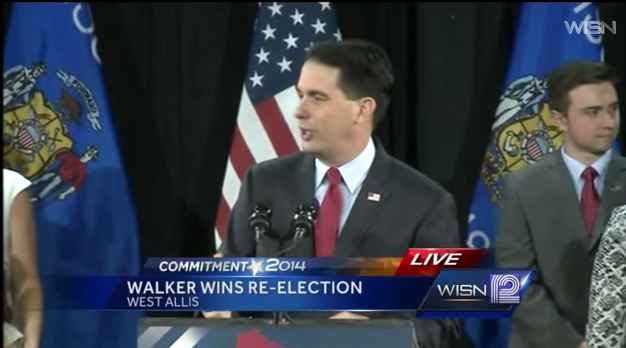 The gubernatorial election results, he said, indicate those in Wisconsin favor a trajectory of growth for their state. “You see, the folks in Washington like this top-down approach that’s old and artificial and outdated that says the government knows best. We believe that you should build the economy from the ground up; that’s new and fresh and organic, and that’s what we’re going to do,” he said. The barometer by which the governor will gauge the effectiveness of his message while in office is a simple one. Knowing how many Americans resonate with such a message will go a long way as Republicans nationwide flex their newfound purchasing power.